40 years may seem like an eternity to some or the blink of an eye for others. No matter if you feel it hasn’t been that long or you haven’t been around for that many decades just yet, this year marks a landmark in Great Parks’ history at Shawnee Lookout. April 1, 2019 marks the final opening day for Shawnee Lookout Golf Course. Opened in June 1979, the course has long been a home for many west side residents. Recognized as being one of the most scenic golf courses in Cincinnati with its rolling terrain and views of Ohio, Kentucky and Indiana from the 18th tee, Shawnee Lookout will certainly be missed. 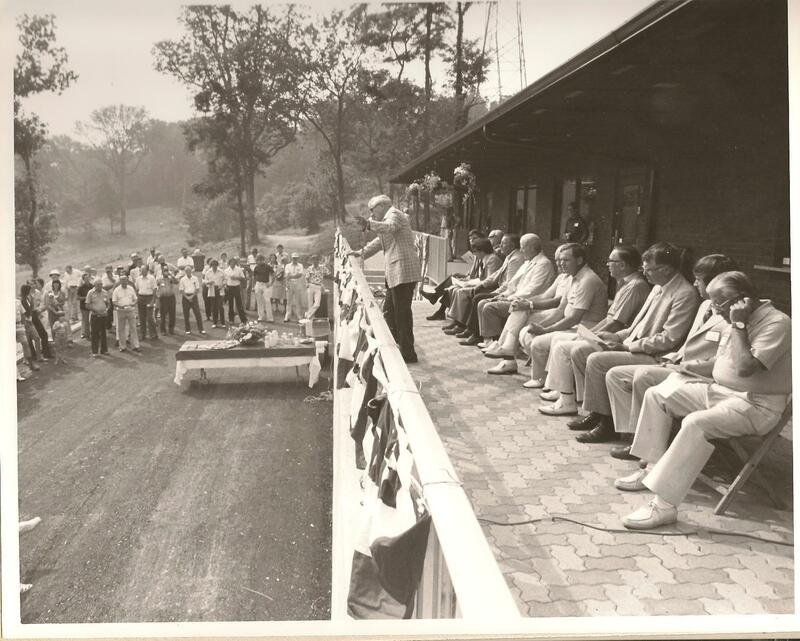 Guests attend the opening ceremony of Shawnee Lookout Golf Course, June 16, 1979. Seated fifth to the right is none other than the first man on the moon, Neil Armstrong. He was one of the first people to hit a golf ball at the course. Many golfers who play at Shawnee Lookout enjoy the relaxed pace of play; the ambiance lends itself to creating calmness and peace of mind. In addition, the grounds are home to a plethora of wildlife that can often be seen during a round of golf. From turkeys to white-tailed deer to red-tailed hawks, golfers are granted a rare opportunity to catch a glimpse of the splendor of the natural world. Over the years, we have seen countless golf leagues play their way through the hilly course. One league in particular, nicknamed “Kelly’s Heroes,” has called Shawnee Lookout home since the facility opened. The league will return to commemorate the course for its final year and we hope you do too. The last day of play is scheduled for September 30.